Julia Bledsoe discovered yoga’s transformative benefits at age 17. Yoga remained a constant but quiet presence until life’s inevitable stresses, aches, and pains led her back to the mat in 2005 in search of relief and balance. It proved, once again, to be a transformative and stabilizing practice. Julia embarked on a 200 hour teacher training in 2014 with We Are One Flow, Reno. This training ignited Julia’s interest in yoga therapy. 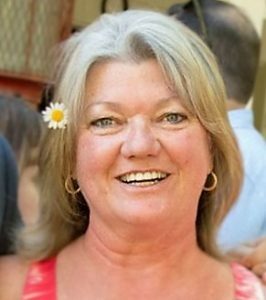 Her exploration and study of yoga therapy and stress management began in 2015 with Yoga Tree, SF and continues 4 years and 700 hours later with the Stress Management Center of Marin where she is studying yoga therapy under the expert guidance of Robin Gueth, Mirka Kraftsow, Kaya Mindlin, Simone de Winter, Lynn Weinberger, Harvey Deutch, and others. Julia’s mindful gentle approach to yoga is accessible for everybody. CLASSES: Mindful Care Yoga, Tuesdays, 5:45 – 7 pm. Drop-ins welcome. CLASS FEES: $15 drop-in, class series available: visit www.mindfulcareyoga.com for more info. Mindful Care Yoga introduces a balanced blend of breath awareness, classical and restorative poses intended to release stress, improve functional movement and balance. It is offered in a safe and supported environment. No two bodies are alike, this is yoga for everybody. All ages, body types, and fitness levels are welcome. These classes are suitable for those living with chronic illness, recovering from cancer, trauma, or injury. All levels are welcome.